Joseph’s running feet hit the hard cobblestones that covered Beekman Street. The Nazi soldiers behind him shouted “Halte” in German, but Joseph didn’t stop. Fear and determination made his feet move so fast that now he couldn’t even feel the cobblestones. He dodged up and down the narrow alleyways and soon the shouts of the soldiers faded into the distance. He leaned against a brick wall, trying to catch his breath. He felt inside his coat. Yes, the package of bread and cheese for Otto was still there. He felt his heart racing like the engine of one of the trucks that the Nazis had used to take away Otto’s parents. The Nazis had invaded Holland in 1940, and now they were rounding up Jewish people to send away to what Papa had called work camps. They had already sent Otto’s parents to a camp and now they wanted to capture Otto and send him away too. Joseph made himself take slow, steady, breaths until he felt the oiled paper covering the sandwiches instead of his heart.He had lost the soldiers, at least for now, but he had to get to DeZwaan and warn Otto and Karena. Silently he slid through the dark streets. Pin pricks of lantern light danced behind curtained windows like fireflies , but Joseph knew that if he knocked on doors, the Nazis would come for the people that answered. He crept through the dark sea of houses, shops, and church steeples until he reached the mill pond. De Swann stood like a sentinel on its southern bank of the pond, its arms reaching out to him. He hurried to melt into its protective shadow and as he slipped into the side door he heard the clatter of Nazi jackboots on cobblestones and their shouts to each other. They had followed him! Swiftly Joseph ran up DeZwaan’s narrow wooden stairs to the fifth floor grinding room where he had left Otto and Karena. Tiny particles of grain from the grindstones floated in the air. He hurried across the wooden floor to the cubby hole in the corner of the room where burlap bags to hold grain were piled. Where were Karena and Otto? He had to find them and warn them that the Nazis had followed him. Suddenly, one of the burlap sacks sneezed. “Karena, it’s me,” Joseph said. He couldn’t help smiling. Karena always sneezed nonstop whenever a bit of dust swirled in the air. Karena was twelve, a year younger than him, and even though she was a girl, she was his best friend. She was the only one of his friends who dared to dodge through the dark streets of Vinkel dodging pursuing Nazis and hiding fugitive Jews in the windmill called DeZwaan-the Swan. “Gesundheit!” one of the burlap sacks said. Otto whispered frantically. “Where can we hide? Karena pointed to the ceiling. “Up there,” she said. Karena pulled Otto free from the pile of burlap sacks. She steered him over to the walls which were mostly exposed two by fours. “See, there are little footholds here and here,” she said. Joseph hurried over to help Otto climb the toe holds and soon he sat astride one of the beams. The darkness under the eaves blotted out his shape and Joseph had to strain his eyes to see Otto. “Stretch out flat!” Karena ordered Otto. Joseph watched Otto’s shadowy figure flicker and waver and when he had stretched out flat on the beam, his body became part of it. Oscar kept quiet and didn’t breathe and so did Karena and Joseph. They clung to the beams like monkeys while the soldiers searched the room below for them. Joseph watched one of the soldiers kick the pile of burlap bags with the toe of his boot and another come over and jump up and down on top of them. Other soldiers fired into the cubbyholes with their guns. Joseph heard Oscar gasp and he hissed, “Be quiet.” Fortunately, the sound of the gunshots covered the noise they made. Joseph hoped that the soldiers would soon get tired of searching for Oscar and go away, but they kept poking and prodding into all of the dark corners of the room. Several of them even picked up one of the millstones and looked underneath it. Joseph hoped the soldiers were getting tired and would leave soon. The soldiers didn’t leave. Instead, they sat on the burlap sacks and pulled bread and cheese out of their knapsacks and washed it down with long drinks from their canteens. Joseph felt the sandwiches inside his jacket squish up against the wooden beam. His mouth felt dry and parched. Oscar stopped squirming, but then Karena started squirming. Joseph wanted to shout at her, “Stop, Karena, don’t sneeze!,” but he knew it wouldn’t do any good. Karena sneezed through everything, even Nazis searching for them. Desperately Joseph looked around for something to make enough noise to cover Karen’s sneezing. He saw a medium sized rock wedged in the corner of the roof where two beams came together. Slowly he inched his way toward the rock, expecting to hear the soldiers firing at him any minute. When they didn’t, he moved more quickly. He could hear Karena trying to smother her sneeze. “AHHH! AHHH!” Karena said. Joseph’s fingers closed over the rock just as Karena burst out with “AHHHCHOOO!” He threw the rock through the beams as hard as he could. It had to make lots of noise. The rock sounded like a thunderstorm, one that boomed loudly enough to cover up Karena’s “AHHHCHOOO!” The Nazi soldiers provided more thunder by shooting at the rock and lightening by shining their flashlights at the rafters. Joseph huddled in his corner where the rafters came together and he made himself as small as he could. The flashlight beams circled his hiding place, but they didn’t light up the dark corner where he was hidden. Joseph held his breath. One of the Nazi soldiers picked up the rock and held it out in his hand. He said something in German to the soldiers gathered around him and they all laughed. Then one of the soldiers shouted an order at the rest of them and they all crowded around the wooden stars and started back down to the ground level of De Swaan. Joseph listened to their fading footsteps and slowly let out his breath. He stayed huddled in the corner for another ten minutes to be certain the Nazi soldiers were really gone and then he slowly inched his way across the beam to Karena. “Do you have to sneeze again?” he whispered. Joseph and Karena wriggled over to the beam where Otto still lay stretched out full length. “You two look like snails, “ Otto told them. “We have to move quicker than snails,” Joseph said. “We need to take Otto to the next safe house and get home safely ourselves. Otto slid over to the edge of the rafter beam and climbed down the toeholds in the wall. Joseph and Karena followed him. Otto stood in front of Joseph. The look in Otto’s brown eyes reminded Joseph of his pet rabbits. “There is no house that is safe,” Otto said. “We will hide you as safely as we can,” Joseph told him. “AACHOO! It’s dusty up here,” Karena said. She started down the wooden stairs without looking back to see if Joseph and Otto were following her. Joseph followed Otto and Karena down the dark, dusty stairs to entrance of DeZwaan. Before he got to the bottom of the stairs, Joseph saw wavery figure in the millpond in front of DeZwaan. He jumped back and pulled Karena and Otto back into the mill. Otto didn’t ask any questions. He rolled over and over across the floor of the mill and found a closet to hide in. Karena rolled after him. Joseph stayed on guard in front of the doorway, ready to sound the alarm and to fight if necessary. He didn’t take his eyes off of the millpond and the shadowy figure flickering across it. Joseph was sure the figure was a Nazi soldier, waiting to trap them. An hour crept by and then two hours. The moon sailed across the sky like a schooner on cloudy seas. The bright moonlight illuminated the wavery figure on the mill pond. Instead of a Nazi soldier, the wavery figure turned out to be wavery branches from a large oak tree growing on the bank of the mill pond. Joseph ducked inside of DeZwaan to get Karena and Otto and the three of them slipped through the dark streets of Vinkel. They left Otto at the safe house. Joseph shook his hand and wished him good luck and Karena hugged him. A woman with a shawl covering her face pulled Otto into the house and closed the door behind them. The colors of sunrise streaked the sky as Karena and Joseph made their way home. 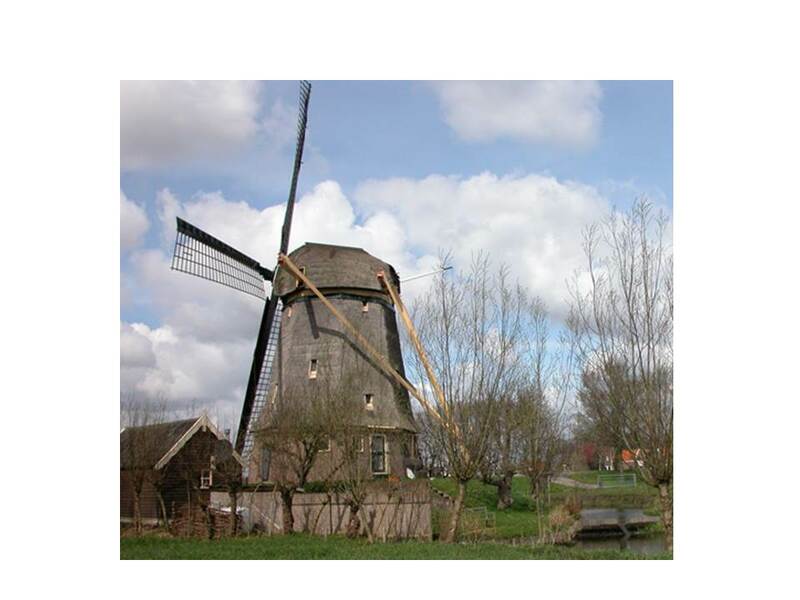 By the time World War II ended in 1945, the guns and explosives of war had damaged DeZwaan, but both the wind mill and Joseph survived to travel to America.